If there is one thing I truly appreciate it is a really, really good Caesar salad and what makes it really good is the dressing. And bacon because that makes everything better (seriously). 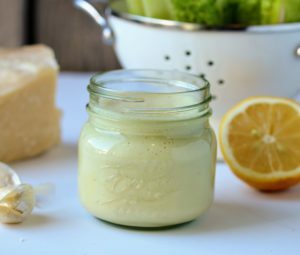 This dressing is one that my Aunt Lorraine has been making for more years than I can remember now and Caesar salad has always been a staple at all of family dinners at her house. I have given it just a small upgrade by using a combination of both Extra Virgin Olive Oil and Avocado Oil instead of a vegetable or canola oil because I am a firm believer that those types of oils are too heavily processed which allows for them to become easily oxidized which can promote inflammation in our bodies. To keep it gluten free I use fish sauce or an anchovy filet or two. If you just turned your nose up at either of those, STOP IT RIGHT NOW! That is what gives this and any other Caesar dressing it’s unique flavour. It’s called umami which is the fifth taste in food (the other four are sweet, sour, bitter, salt). I love this dressing so much that I don’t just use it for a traditional Caesar salad. I love it on a Cobb salad too. It’s great as a dip with veggies. The best thing about this dressing is that you can make it all in one jar and it is mayo free because you are essentially making your own mayo by blending an egg and oil together. Look at your bad self being a master chef! I like to go heavy on the garlic because you never know when you might run into a vampire looking for a snack of their own. Add all ingredients to jar and mix using an immersion blender. Pour over lettuce and serve immediately.